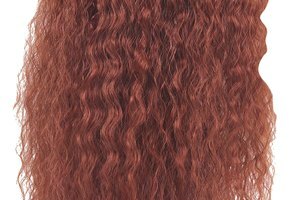 You can crinkle, or crimp, your hair easily and quickly by using a hair crimper. But like a flat iron, the heat from the crimper can do more damage than good as it dries out and damages your hair. Instead, you can braid your hair to get the same effect without being damaging to your hair. You can also easily control the crimps by the size braids you use--fat braids for soft waves or small braids for tight crimps. Braid your hair in as many or as few braids as you choose. 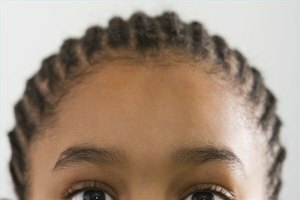 Ensure that you start the braids as close to your scalp as possible. You may need the help of a friend to braid the back of your hair to ensure even crinkles. Secure the ends of each braid with a small, plastic hair tie. Do not tie the hair tie too tightly around the end of your braid to prevent a crease. Take a shower and--very carefully so as to not snag your braids--shampoo your hair. The shampoo will help to set the braids into place. 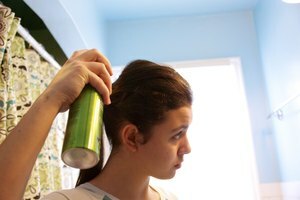 Blot your hair with a towel to remove excess moisture. It's helpful to leave in the braids until your hair is entirely dry. You can go to bed with damp braids and they will dry overnight. To prevent snags and flyaways, you may want to wrap your hair before lying down. Remove each hair tie in the morning. Tousle your hair with your fingers or a hair pick to separate the crimped hair. Apply a setting lotion to your damp hair while they are still in braids to control flyaways and to keep your waves looking great for days.